A cultivar of Camellia reticulata Lindl. Fully-hardy open-branched small tree or large shrub with elliptic, leathery leaves and very large, semi-double, carmine rose-red flowers, to 11cm across, in spring. To 15m. [RHS, Hilliers’]. ‘This Camellia came from China. It is considered by all botanists as a distinct species. It differs, in all respects, from C. Japonica, by its rounded, flat, and strongly reticulated leaves, as well as by its silken ovary, which is not to be found in the other species; bud very large, conical, two inches long before it opens; calyx pentaphyllous, of a yellowish green; leaves oblong, acuminate, reticulate, dentate, of a deep green; flower very large, five inches in diameter, semi-double; petals, in number from twenty to twenty three, undulated and inserted in a loose and irregular manner, of a bright cherry-red, No.2, shaded with rose; stamens numerous and irregularly placed, some erect and others curved; anthers broad, of a dull brownish yellow, which but illy comports with the splendour of the petals. This flower much resembles that of Paeonia arborea rosea, when this is only semi-double, which is often the case; of the same colour and the same form. – Magnificent.’ [Berlèse Monography p.49/1838]. Introduced from China in 1820, the plant described by Lindley and now known as ‘Captain Rawes’ was thought to be the wild type until the single-flowered form was introduced by George Forrest in 1924. ‘Captain Rawes’ was figured in a number of the botanical journals and first flowered in 1826. 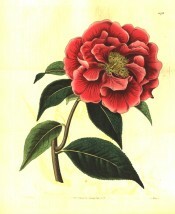 ‘The drawing of this splendid species of Camellia was made by Miss Curtis in the spring of 1827, from the plant imported by Captain Rawes, in the collection of Thomas Carey Palmer, Esq. at Bromley, Kent’. [BM t.2784/1827]. Today, flowers of the many cultivars may be single, double or peony-form, in white, pink or red. BR f.1078/1827, MB p.101/1836, BM t.4976/1857, IH pl.306/1861. Listed in all published catalogues [T.276/1843]. Plants of Camellia “Captain W.”, probably this plant, were presented to the Sydney Botanic Gardens by William Macarthur in December 1845. [RBGS AB].